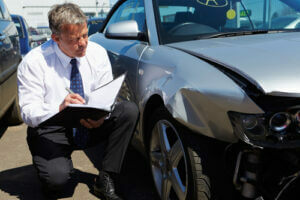 Loss adjuster inspecting car involved in an accident. Photo courtesy of Shutterstock. The insurance industry is an ever growing one with more people wanting to insure everything that they value most and this also makes this industry a very lucrative one especially if you wish to make a career in this field. With the boom in the insurance market, employment opportunities have also increased tenfold. When it comes to the field of insurance, you can be assured that with a financial background in banking, insurance and the likes, you will have several career options at your disposal and you can essentially select the one that fits your personality and choices well. If you would like to do some quality reading in order to understand every aspect of the realm of insurance then you should certainly consider visiting http://cheapautoinsuranceusa.com to get a complete and clear picture of what to expect in a career in this field. Essentially, you need to realize that the job of an adjuster is an extremely stable one. Therefore, when you enter this field, you can be assured that you will not want to have to worry about being removed from your job due to lack of availability of openings. The dwindling and ever changing economic situation has almost absolutely nothing to do with being an adjuster as the claims situation will remain the same in almost all cases. Besides, there is also an ever increasing demand for adjusters and compared to the stability that this job provides, the corresponding skills and qualifications that you essentially require are far less and most importantly, they can be learned and adapted to quite easily. This makes it a very favourable job opportunity for aspiring employees. There are certain types of adjusters that cater to that specific aspect of insurance and therefore, if you want to be successful in what you do, you will have to select one aspect that you believe is perfect for your level of understanding and experience and work towards achieving specialisation in that area. Essentially, you could be a full time adjuster or could work as a freelancer based on contracts. Besides, you could also be a catastrophe adjuster dealing with both natural and manmade catastrophes. Before you begin working as a professional insurance claims adjuster, you will require a license to prove your credibility. The license requirements vary from on state to another and therefore, you need to be very careful and try to find out more about the state requirements in which you would like to work as an adjuster. Based on what state you are living in or plan to work in, you will also be required to answer a state exam on insurance in order to get access to the license to start working. While being an adjuster and working as one is a fairly simple task, it is not exactly everyone’s cup of tea. You need to be well versed with using software programs that have been specifically designed for an adjustor. Besides, your ability to adapt to the changing trends in this field will also determine your level of success. More than anything else, nothing will teach you how to work as an adjustor like a job in that particular field. It will familiarise you with all the concepts that you need to know and will give you experience that will help you understand as to whether or not you are suited for that particular job. John Baker is the CEO of a well known banking and insurance firm that is also involved in offering financial services including financial planning. He has recently collaborated with http://cheapautoinsuranceusa.com/ to provide more and detailed information on the various kinds of insurance that people can buy.